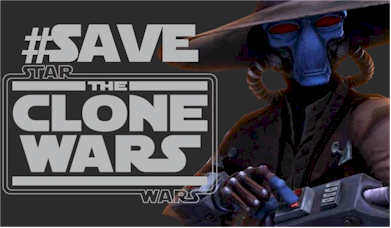 Save The Clone Wars: Star Wars: The Clone Wars: The Lost Missions? Star Wars: The Clone Wars: The Lost Missions? Supposedly news about the bonus content and a trailer for ther material was shown in Warsaw today. This was first reported at http://www.star-wars.pl/News/17527, (translated version), and the news spread quickly today among Star Wars news sites such Star Wars Underworld. If the information is accurate, the remaining episodes of Star Wars: The Clone Wars will be subtitled the "Lost Missions" and will air on Disney XD early next year. At least one part of this information has already been debunked by LucasFilm's Pablo Hidalgo, but that could also lend more credence to the other information listed below, since it was not a complete denial. @Halabrew not sure where "10 episode" comes from either. That number sounds too low. Please remember the Google translation below of the information from the Polish website may contain spoilers, if the information is accurate. Trailer began by showing a dark, damp fog covered the planet - it was accompanied by the voice of Qui-Gon, saying: "You must go to the Dagobah (? )., Where you will find your answers." I landed there Yoda. Many loose scenes related to a ripe old master: in one of them walked among red, dust-covered rocks (Korriban? ), The second was in a dark building and ran up to him being a bit reminiscent of the Balrog from "Lord of the Rings" - consisted of smoke and fire , in another fight on the platform of a hooded figure, equipped with a red lightsaber, another presented him how to jump the airborne platforms, leading to what looked like a huge tree, located on the background of the cloudy, yellow sky, and finally, you will see Yoda was like talking with a group of representatives of a new breed - were round, white and maroon faces and golden eyes. Oppo Rancisis was present at the meeting of the Jedi Council. Members of the steel circle over Yoda and bent over him. One scene showed a lot of ghosts (or perhaps invisible) Jedi, taking part in the battle. Certainly back on Kamino - were aiwhy, cadets in helmets, learners in front of computers, Shaak Ti also returns. Clone of another forerunner - the one who killed one of the sisters of the Jedi - thrashing about on the bed, tied to the belt, and the voices in the background said that "does not remember the day it happened." In the longer terms, medical droid came into fives, calling it "CT-5555", which did not like the man who pointed out to him that the clones have names and it is important for them. Sidious contacted holographically with Lama Su and other Kaminoaninem, saying: "The truth of order 66 can not come to light." Mother Talzin fired its green rays, and later fought with someone with a sword with a blue blade (perhaps it was Obi-Wan). Showing the new machine Separatist - a bit like aqua droids episode of inkwells, but painted with red paint. Count Dooku will fight with two species of blue swords - they were probably Skywalker and Kenobi. Padme stood before the congregation Muunów, and one of them shouted: "You're under arrest!" It also shows some new shots of the chase Emba on the ice planet. Mace Windu fought with giant robots. Shown computer hologram displaying the silhouette of a man with black hair in a Jedi robe - was very similar to Sifo-Dyas comic book "Eyes of the revolution."